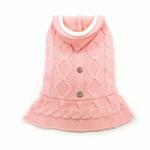 Dogs will stay warm and stylish with the Cable Hoodie Dog Sweater Dress by Dogo in Pink! The classic pattern in this cable knit sweater will have you feeling warmer just looking at it! This cable knit sweater dress with hood will keep your pup cozy and warm. We love the wooden button details and the convenient leash access hole. The contrasting trim at the hood and arm holes are a sweet touch. The ruffle skirt adds additional feminine charm and more length to keep your pup warm. The high-cut tummy will ensure your pup stays clean and dry all day. Garment Care: Made of 60% wool and 40% acrylic. Hand wash only. This sweater from DOGO suits a wide range of dog breeds and goes up to a size 4XL! Cable Hoodie Dog Sweater Dress by Dogo - Pink Customer Photos - Send us your photo! Lily Girl is quite the Princess and loves to dress up. She is a Yellow Lab / St. Bernard mix. She is so gentle and loves her Grandpa. Going on walks, car rides and rough housing with her Brother Baloo are some of her favorite things to do. Posted On 01/31/19 by Korena S from King City , OR Yes, Korena S recommends this product! Have this in red and decided to get in pink as well. It’s such a light baby pink color. Beautiful on my chocolate cocker! Posted On 08/13/18 by Danielle P from Hampton Falls, NH Yes, Danielle P recommends this product! Okay, this is cute! I ordered a size 3XL for my rescued Pit Bull. She's 47 pounds. Her chest is 27" and her neck is 19". This fits her slightly big, covering her bum, but I wouldn't size down. This sweater is very pretty in person and is cozy and soft. I'm looking forward to Autumn weather so she can wear it out! It's very well made with strong seams. The cable knit pattern is absolutely adorable! Buy it. Posted On 03/01/18 by Priscilla B from Centreville, VA Yes, Priscilla B recommends this product! My Boston Terrier looks amazing in this sweater. When she wants to look sharp, she chooses this sweater. Posted On 07/18/17 by Susan A from Long Beach, CA Yes, Susan A recommends this product! This is a beautiful, well-made hooded sweater dress. I purchased two if these: one for my 11 lb mini-poodle mix and one for my 3.5 lb pomeranian. They both look fantastic and is perfect for colder days. I absolutely recommend this item. Posted On 07/12/17 by Donna L from Lutherville, MD Yes, Donna L recommends this product! Posted On 02/09/17 by Sandee L from Bullhead City, AZ Yes, Sandee L recommends this product! This sweater fits my dog perfectly. She looks so adorable in it and she loves wearing it. This is the 3rd one I have purchased. Love them. Posted On 12/09/16 by Sandee L from Bullhead City, AZ Yes, Sandee L recommends this product! This sweater is just beautiful. My puppy has one in red that she just loves. I purchased the one in pink but it was too large for her. These sweaters get so many compliments when I take her out in them. Beautiful sweaters! Posted On 11/18/16 by Jenna S from Braintree, MA Yes, Jenna S recommends this product! Looks exactly like it does on-line! ?? Posted On 11/15/16 by Michael P from , Yes, Michael P recommends this product! Can't review this product. We haven't received it. Posted On 11/07/16 by RIta I from Chalfont, PA Yes, RIta I recommends this product! Posted On 08/25/16 by tress E from Fort Mill, SC Yes, tress E recommends this product! LOVE IT!!! Very feminine and will be great for girls... Just wish it had a d-ring so they could just wear the sweater. Posted On 01/23/16 by Ashley T from , NJ Yes, Ashley T recommends this product! It looks cute and fits well. Posted On 01/10/16 by Tara M from Beavercreek , OH Yes, Tara M recommends this product! Well made. Pretty long so if you have a dog that is long this dress would work well. Posted On 12/30/15 by Mireya S from , Yes, Mireya S recommends this product! Nice thick sweater with adorable little button accents. The photo does not do it justice. Posted On 12/14/15 by Lisa from , NC Yes, Lisa recommends this product! While this sweater dress looked adorable once on the dog, it is difficult to get her legs into the holes! They aren't very wide. Poor Olivia wasn't very happy with me for taking so long to get her sweater on. Once on, it looked adorable. Just not sure how much use we will get out of it. Posted On 10/26/15 by Diane S from Weatherford, TX Yes, Diane S recommends this product! I am in Rescue. These pups come without collars, toys or leashes. I try to make sure every rescue has a clooar, leash and toys.